A new 34-page report from Healthnewswires.com details the 5 worst and best cooking oils for a healthy waistline and improved health. The 5 Worst Cooking Oils report details the importance of supplementing with a quality, natural oils to lose weight and improve health. 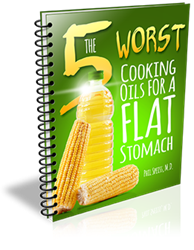 The 5 Worst Cooking Oils For A Flat Stomach report describes how many of the most common cooking oils are creating toxic situations in the body; making it harder to lose weight and contributing to major health complications. The new report provides must know health information, including the number one worst oil to cook with, how certain oils expand your waist and damage your cardiovascular health and how 5 common cooking oils are putting people at risk for significant health complications - including heart disease and metabolic syndrome. DHA and EPA found in fish and krill oil is effective in lowering triglyceride levels in the heart, blood and liver; decreasing inflammation; and improving brain health, including both short and long-term memory. Information provided in the free report also shows a particular type of fish to completely avoid, especially if trying to lose weight and burn fat. The report also provides information on the best oil of all time, especially for supporting health and losing weight. A complete The 5 Worst Cooking Oils For A Flat Stomach from Health News Wires is available at http://healthnewswires.com/5-worst-cooking-oils/.